Vortical structures (shortly: vortices) virtually surround us in a normal life. However, we usually do not perceive them as vortices unless somehow visualized, even in the case of dynamic effect on us. We cannot even exclude their local presence in our respiratory or cardiovascular system. A number of vortices relate to human activities, engineering, technological processes and devices: starting with vortices generated in the wake of various means of transport, high-rise buildings and constructions, and ending with mixing processes and vortex separators. Vortical structures dominate in many problems of transition to turbulence and turbulent flow regime―the interest from both physical and engineering point of view for a long time. Vortices play an important role in macroscopic transport of momentum, energy and mass. Vortical structures, if once generated, are able “to live on their own”. It includes (in unsteady flow) their generation and growth, interaction with other flow structures, particularly with other vortical structures, interaction with a wall, solids and constructions, and finally decay of a vortex if there is no (sufficient) energy source. Vortices in nature and technology, though so significant, are mostly invisible. Their dimensions range from incredible several ångströms (10-10 m) in superfluid form of helium to dimensions of spiral galaxies expressed in terms of light years. As already said, vortices belong to the most characteristic dynamic flow structures, this is why sometimes they are compared to “the sinews and muscles of turbulence” (Dietrich Küchemann, famous aerodynamicist and aeronautical design engineer). In connection with vortical structures there are inevitably a lot of questions, however, we are interested in the fundamental question “What is a vortex?“. The answer seems to be intuitively clear with regard to this characteristic phenomenon in fluid flow and its “easy-to-follow” kinematics. Unfortunately, the true exact mathematical/physical answer, the vortex definition or vortex identification, remains a subject of a lively discussion in the literature. In view of the flow diversity of vortical flows, there is no doubt that universal and physically justified tools―identification methods and criterial quantities―serving the purpose of vortex identification are necessary and very useful. These tools are derived from some dominant vortex feature. It is based on kinematic and/or dynamic characteristics, usually velocity data, especially their (local) changes in space and time, and possibly pressure data and their changes. On the basis of vortex-identification results, we can proceed to the study and explanation of vortex dynamics in transitional and turbulent flows, and we can shed a new light on other vortex phenomena. Flow around a flat plate (aspect ratio 2, angle of attack of 30 deg, Re = 300, numerical simulation): Comparison of isosurfaces depicting from left to right vortex given by the residual vorticity, shear, and residual strain rate based on the triple decomposition of the velocity gradient /top/ with vortex isosurfaces determined by the method of average corotation of line segments near a point, average shear, and deformation structures characterized by average contrarotation /bottom/, according to Šístek, Kolář (2017). The first serious problem of vortex-identification is that the standard intuitive measures fail. 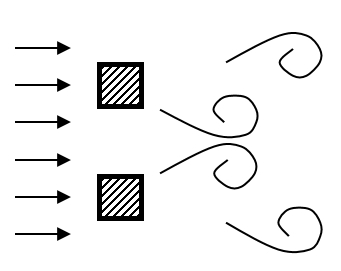 Let us mention a few typical examples: (1) closed or spiralling streamlines (or pathlines) are, unfortunately, not Galilean invariant, that is, not independent of the uniform translational velocity of an observer, (2) vorticity, Galilean invariant quantity expressing an average angular velocity of fluid elements, cannot distinguish between shearing motions and the actual swirling motion of a vortex, (3) local pressure minimum does not guarantee the existence of a vortex. These facts have motivated the rise of a number of more sophisticated methods. These methods can be roughly divided into kinematic and dynamic (according to its nature), local (pointwise information is needed, for example, velocity-gradient data at the given point), non-local (simultaneous information from multiple points in the flow domain is needed at each examined point), and finally region-type schemes (providing the vortex volumetric region) and line-type schemes (providing a vortex-core skeleton, i.e. the central axis consisting of points where the swirling intensity is maximum in the transverse cut). Some of these requirements are arguable. For example, some researchers require the allowance for an arbitrary axial strain while others require an orbital (spiralling) compactness of a vortex. (1) Development of a vortex-identification scheme based on the explicit elimination of local shearing, however, computationally much faster than the method of the triple decomposition of the velocity gradient proposed earlier―the method of average corotation of line segments going through the examined point has been developed. (2) Practical application of explicit shear-eliminating schemes using a number of typical flow examples, and an extensive comparison with usual vortex-identification methods―the average-corotation scheme and the triple-decomposition method have been evaluated for four types of flow; it has been shown that the explicit shear-eliminating methods are more efficient in regions of strong shear. (3) Modification of the well-known criteria for the description of compressible flows―the widely used Q-criterion has been modified in terms of the vorticity vector and the principal strain-rate diference vector. 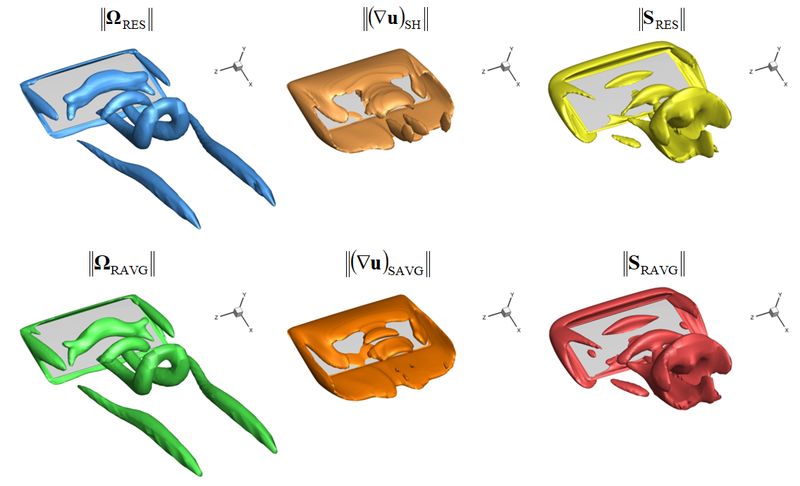 (4) Development of methods for the simultaneous description of the whole flow field, covering not only vortical structures, but indicating also the regions of dominant strain rate or dominant shearing―the method of average contrarotation of line segments going through the examined point has been developed and applied; the average contrarotation is (together with average shear) complementary to the above-mentioned average corotation according to item (1) above. Šístek, J., Kolář, V., (2017). Average contra-rotation and co-rotation of line segments for flow field analysis. In: Journal of Physics: Conference Series, November 2016, Kuching. Bristol: IOP, 012070. Kolář, V., Šístek, J., (2015). Corotational and compressibility aspects leading to a modification of the vortex-identification Q-criterion. AIAA Journal. 53(8), 2406-2410. Kolář, V., Šístek, J., (2014). Recent progress in explicit shear-eliminating vortex identification. In: The Proceedings of the 19th Australasian Fluid Mechanics Conference, December 2014, Melbourne. Melbourne: RMIT University, Paper 274. Kolář, V., Šístek, J., Cirak, F., Moses, P., (2013). Average corotation of line segments near a point and vortex identification. AIAA Journal. 51(11), 2678-2694.